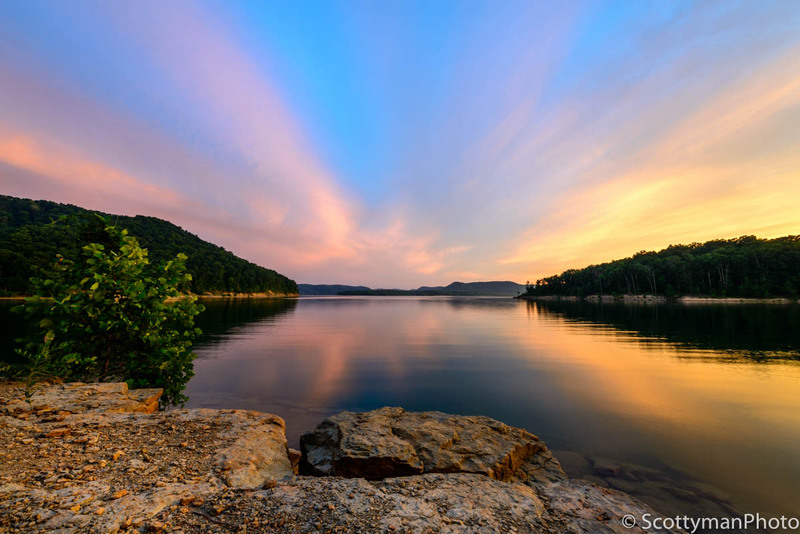 An amazingly colorful sky at Cave Run Lake in the Daniel Boone National Forest in Kentucky. Captured at Windy Bay Fishing Point. Captured: June 27, 2016 @ 6:03 a.m.
Tour the vastness of Cave Run Lake and gain priceless travel photography tips and advice while experiencing one of the most amazing lakes in the world. Captured in the Daniel Boone National Forest, in northeastern Kentucky near the city of Morehead at Windy Bay Fishing Point, this featured image reveals the true beauty of Cave Run. Truly one of the most beautiful places in Kentucky with its many stunning coves, corners, bends, and twists, this lake will never fail to impress even the most ardent and experienced traveler. Raised and nurtured by this beautiful lake and forest, although at the risk of appearing biased, I honestly feel Cave Run Lake is one of the best keep secrets in the travel world. Possessing breathtaking views that beg photographing combined with a variety of activities such as hiking, swimming, camping, fishing, hunting, and boating, this 47-year-old man-made lake will always hold a special place in my heart. Of the numerous images I have captured over the years, I find myself returning to visit this one over and over. This image is without a doubt one of the most valued photographs in my portfolio. If you would like to see more of my images captured at Cave Run Lake Kentucky, take a moment, and visit my Cave Run Lake collection on Fine Art America. Cave Run Lake is also conveniently located near the small college town of Morehead Kentucky. Encompassing a wide range of available activities, planning a small vacation to the area would undoubtedly become a treasured memory for anyone. Having several hotels with the amenities of home, the nearby city of Morehead is only a 15 or 20-minute drive from the lake; furthermore, the lake itself has limited lodging nearby, although most campgrounds for primitive, as well as RV camping. One could easily get distracted and lost in the beauty of a typical sunset at Cave Run. Amazing rocky shores, calm clear water, local wildlife, and a captivating scene reserved for only the truly blessed; additionally, an entrancing forest surrounds all of this amazing splendor. Encapsulated in the distracting magnificence of it all, remember not to forget your camera in the car. Regardless of the countless times I have visited Cave Run Lake, admittedly, I still lose track of time while spending hours lost behind the viewfinder of my camera. From the amazing boulders on the rocky shores to the dark and lush forest packed with wildlife, being at a loss for a subject to photograph seems difficult to imagine; consequently, one may actually find a challenge in selecting from the many tantalizing subjects available. In reality, failing to locate an interesting focus point at Windy Bay is next to impossible. Delivering versatility as well as aesthetic splendor, the available lighting in this location renders it capable of providing opportunities to capture both an incredible sunset and sunrise. Don’t panic just yet, although it does require a short walk to arrive at the shoreline, it’s not steep, starting at the top of a slightly moderate to small hill, one will have to walk down approximately an eighth of a mile. The trail is relatively wide and offers an accessible transit for anyone in fair health. Upon leaving the parking area and entering the trail, you will notice a fork in the path; regardless of your choice, both will end in approximately the same area. 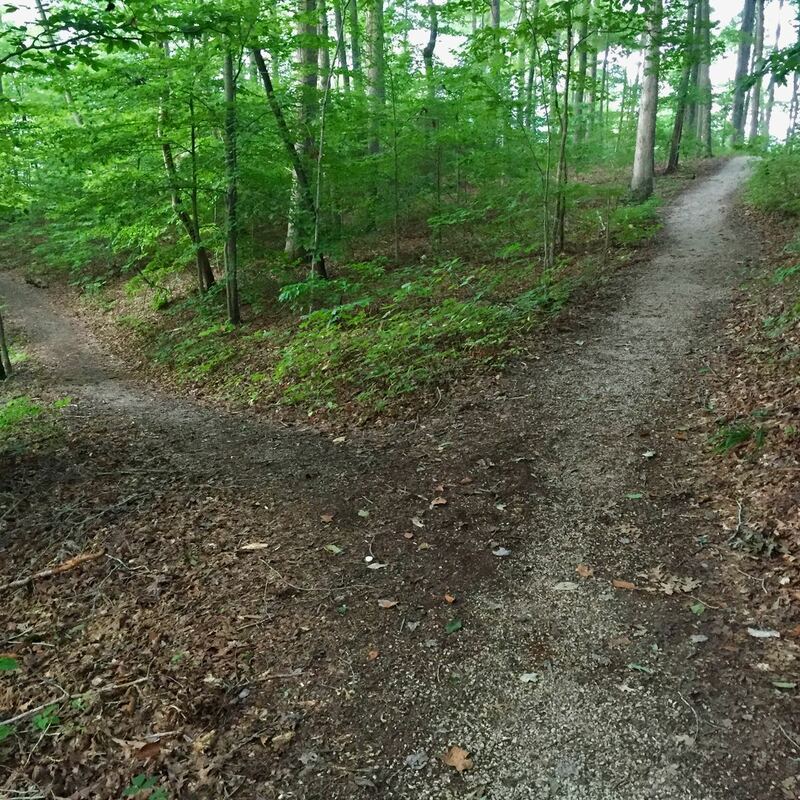 I recommend the path to the right, it’s quicker and slightly easier to negotiate. 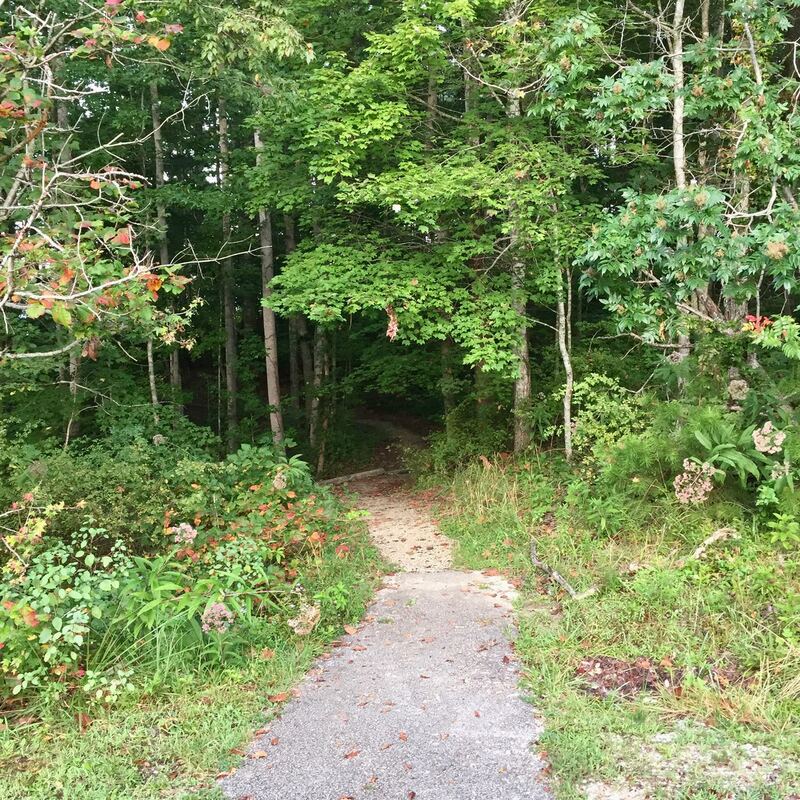 An image of the trail from the parking area that leads to Windy Bay Fishing Point at Cave Run Lake in Morehead, Kentucky. An image of the fork in the trail that leads to Windy Bay Fishing Point at Cave Run Lake in Morehead, Kentucky. No Fees and Great Hours. Windy Bay Point Fishing Point offers unlimited access and no fees for entry. Most areas of Cave Run Lake are accessible for free; however, if desired, one will have to pay to enter the Twin Knobs camping and swimming area. Windy Bay does not really have a smooth sandy beach conducive to swimming; additionally, a moderate chance of getting snagged by a leftover fish-hook is something to keep in mind as well. Barring the desire to dive in for a quick dip, the absence of swimming does have its perks, offering fewer distractions which provided the opportunity to capture a less cluttered image, this is especially beneficial to the landscape photographer looking for a clean scene. Mainly used for fishing, most traffic in the area occurs from nearby boaters and fisherman. Nonetheless, with a little patience, you’ll capture some really excellent images, especially during the Golden Hours. Shooting during the hot summer months is undoubtedly my favorite time of year. Capturing Bay Light at the end of June provided me with an amazing scene and breathtaking views. Faced with the prospect of rain, I had a better than average chance of capturing some stunning cloud cover and colorful skies. Upon arrival, I received a slight rain dusting, yet gained some much-needed contrast and color from the cloud coverage. In addition to the parking lot’s proximity to the bay, Windy Bay Fishing Point can definitely accommodate several cars and trucks, although lacking RV slots, one might potentially slide in on a non-busy day. The parking area sits just below the main road and connects to a graveled trail that leads directly to the fishing point. Although summer is usually the busiest time of year, I can’t see the parking lot overflowing with business; In any case, one may still be able to park along the road if full. 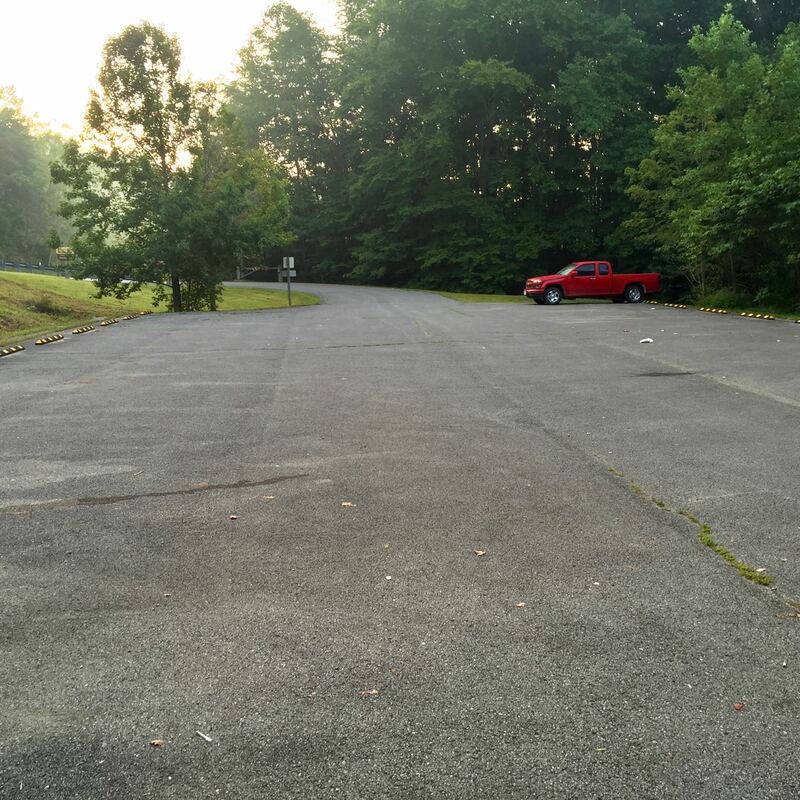 An image of the parking area leading to Windy Bay Fishing Point at Cave Run Lake in Morehead, Kentucky. After processing images at the end of the day, I ask myself if I was able to capture the image I had envisioned. Although extremely satisfied with the end results, room for improvement will always be a concern for me. Fortunately, I did capture a few other images that I felt were worthy of being added to my fine art collection. Check them out at scottymanphoto.pixels.com. Consider the amount of available daylight when planning an early or late transit to the bay. After capturing that awesome sunset, you’ll have to head back in the dark. Finding your vehicle via a dark, scary path presents a daunting challenge without an external light source. After sunset, not having a flashlight at Windy Bay is simply not an option. Reminiscing about the day I captured this image, I think about the amazingly beautiful picture perfect scene Windy Bay exhibits in the evening. Gazing into the sunset, one could easily find themselves lost in deep thought; though, may abruptly find themselves brought back to stark reality by the painful sting of a Cave Run mosquito. Summer may have its benefits, but the mosquitos are not leaving! Unfortunately, some folks just don’t get it! Thus, you may encounter a considerable amount of trash in your travels. Obviously, trash is not environmentally friendly; it’s unsightly and can certainly ruin an image! Personally, I’ll take the high humidity over cold weather any day; however, humidity doesn’t always play nice with my equipment. Nevertheless, summer is my favorite time of year, but it does occasionally have its drawbacks. After hiking down the trail to Windy Bay and unpacking my camera, I, of course, had to wait 20 or 30 minutes for my lens to acclimate to the humidity. With the nearest gas station several miles away, arriving prepared is paramount to a successful photo shoot. Swarming with mosquitos in relentless heat and pounding humidity, water and insect repellant are a crucial part of my inventory. Forgetting something can be costly. Failure to pack the necessary items, such as insect repellant, could result in an ultra-fast exodus to a less hostile environment. Arriving prepared is critical, by the time you return from the nearest store with insect repellant, you may end up missing the golden hour and end up departing without that awesome sunset image you were planning on capturing. Alright, in the interest of transparency, as mentioned earlier, I am from this area. Although, at the risk of sounding biased, I must admit, when it comes to theft and vandalism, I consider the risk very small. Having grown up at this lake, I can’t recall ever having any problems with theft. Nevertheless, before deciding to leave the windows down with your wallet or purse suspended from the rearview mirror, I would consider it prudent to deploy some basic precautions. Lock it up and help keep the temptation for thievery down to a minimum. Undoubtedly at some point, most photographers will encounter a situation that may hinder them from capturing an award-winning image. Like any other place, one may have to hold out and wait for a passerby to move on. To the fisherman, Windy Bay might be a goldmine for catching an award-winning musky (Muskellunge) fish, but to the landscape photographer, the fisherman might become a distraction and prevent capturing an award-winning photograph. Photobombers and other distractions will always present problems, although patience is paramount! Reserved for the ultra-resilient, no one likes visiting a portable toilet, AKA porta potty. Contrary to the rumor mill, if one is in need, one will undeniably make use of this unique place on earth. Unfortunately, for the willing, there are no portable toilets at Windy Bay. Except for the privileged RV traveler or the prepared camper, one may want to consider making prior arrangements. Easily negotiated even while wearing flip-flops, the trail is wide and mostly gravel; however, navigating around the shoreline requires some maneuvering up and down a rocky edge. Of course, this could prove difficult with the wrong shoes. I prefer to eliminate as many distractions as possible; therefore, I prefer hiking boots, but at a minimum, I recommend some type of closed toe shoe. Arrive early and bring a trash bag. Unfortunately, that beautiful scene may require some titivation to remove unsightly items left by those less interested in the environment. I find that cleaning up a little trash is better than just moving it out-of-the-way; more importantly, consider the reward you’ll receive having departed the location in better condition than when you arrived. Bring some latex gloves if you’re a bit squeamish. Plan time to allow your lenses to acclimate to the high humidity. Don’t plan on ripping out that camera and immediately going to work. Give your gear 20 or 30 minutes after being in that air-conditioned car. Nevertheless, I’m sure that some of you are thinking, why not just wipe off the lens and shoot? In fact, other than preventing it in the first place, such as leaving the camera outside overnight, condensation has a tendency to return to the lens even after wiping it off. Personally, I prefer to minimizing wiping my lenses as much as possible. Some of the most compelling images I’ve seen were captured less than a couple of feet off the ground. Additionally, if you’re a beginner, getting out of your comfort zone is also a good idea. Experiment a little, mix it up and get down low. Long ago, I learned the hard way; knee pads are not for you, they’re for your photograph. Knee pads reduce that distracting and annoying knee pain that tends to get in the way; thus, enhancing the quality of your image. Trust me on this one, it’s better to carry a pair with you, even if you don’t need them. Although unnecessary but nice to have, a small chair provides an opportunity for a quick or even an extended break after the photo shoot. Lightweight and compact, the Helinox Swivel Trek Chair is unbelievable! After sunset, I sometimes enjoy kicking back in a comfortable chair with a fine cigar. Don’t leave home without a flashlight. As a landscape photographer, I never leave home without at least one. Although not the darkest place on earth, attempting to depart Windy Bay after daylight hours could provide some additional challenges. Furthermore, having no desire to drop all my gear and run, I prefer to see what lies ahead in the dark, rather than stumble upon an unsuspecting horrid critter. For many of us, traveling with friends is usually preferable; although, one may prefer to enjoy some personal time alone. Generally speaking, I support the buddy system for security reasons, but I feel Cave Run Lake is a relatively safe place. It’s your call, but why roll alone? Don’t forget, if you didn’t bring it with you, a trip to the store and back would take you 20 to 30 minutes or more. What’s even more important, if you’re on a quest for water in the early morning or late evening, you may have difficulty locating a store that hasn’t sold out, especially on a summer weekend.